You may say that you love your family, your spouse, your church, or the Lord. You may also express love for more temporal things like a good cup of coffee, your home, or a nice dinner at your favorite restaurant. But it is rarer to truly say "I love my life!" It's common to be more frustrated with life than at peace with it, because the daily grind wears you down. Responsibilities and burdens become heavy and rob you of the happiness you're meant to have as a child of God. But you can be hopeful, learn to rise above your challenges, and be filled with wonder at what God might do every day. 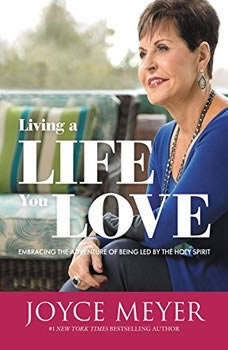 Written by #1 New York Times bestselling author Joyce Meyer, who has gone from heartache to happiness through Christ, this book is the key to shifting your perspective so that you may also relish every moment and every part of life. You will learn how to love life fully, in spite of your obstacles, and experience the happiness that is promised to you. Joyce will explain: Why you can't love life unless love is the central theme of it,Why your attitude affects your life more than any outside circumstances,How the love, help, and kindness you give away will come back to you immeasurably,How to look to the future and keep your joy,And so much more! God has already blessed you with a life to love--and it's time to start LIVING A LIFE YOU LOVE.